The weather brains say that temperatures tonight in southern Ontario will plummet to -40C. This makes me feel a bit blue. Still, let’s turn that blue into something beautiful. Here’s some lovely hydrangea ~ one of my favourite summer flowers ~ to help ease the pain. This entry was posted in Canada, Flowers, Garden, Musings, Nature, Photography, Uncategorized and tagged Aimwell CreativeWorks, Dorothy Chiotti, flowers, gardens, hydrangea, Ontario, Photography, southern Ontario, Weather, winter. Bookmark the permalink. 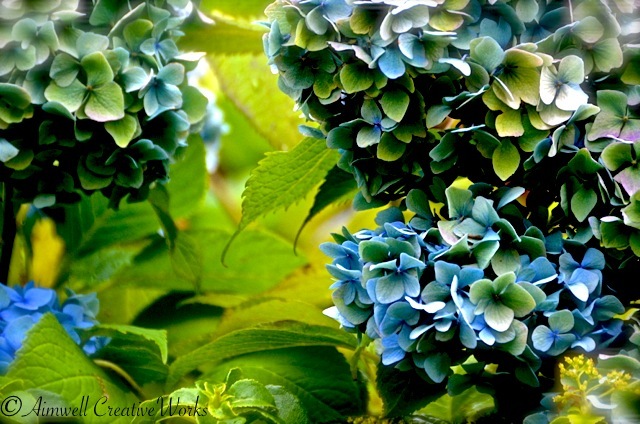 Beautiful photo of hydrangea. I like the composition. Blues and greens; love them! What a beautiful sight for sore eyes….I can almost smell the fresh earth and sweet blossoms. Thanks for the pick-me-up, Dorothy.